AP Contract Employees Minimum Time Scale now Rs.12,000/-Time Scale Enhanced to AP Contract employees working in Government Departments in the RPS 2015 AP GO. No. 12 Dt. 28-01-2019 | New minimum salary to ap contract employees | ap contract employees job salary revised rates. Extension of Minimum of time Scale to the Contract employees working in Government Departments in the Revised Pay Scales, 2015 vide GO Ms. No. 12 Finance Dt. 28-01-2019. The Government is hereby order for Extension of Minimum of time scale to the contract employees working in various Government Departments in the Revised Pay Scales, 2015 of the relevant posts, in which the employees are working. the existing remuneration, whichever is less, with a condition that the revised remuneration shall in no case be less than Rs.12,000/- p.m., w.e.f. 1st April, 2017. 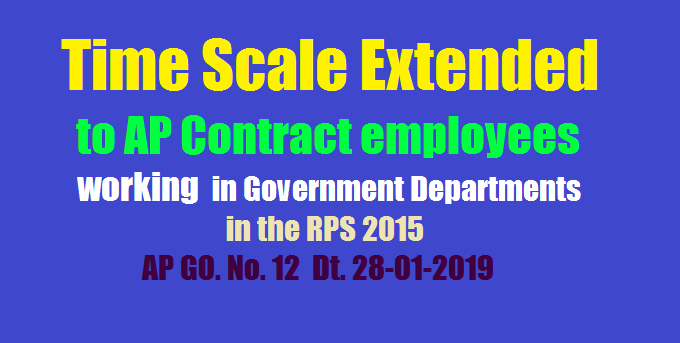 The benefit of Extension of minimum of time scale to the contract employees working in various Government Departments in the Revised Pay Scales, 2015 shall come into force w.e.f. 01-04-2019. 1. G.O.Rt.No.3080, General Administration (Cabinet) Department, dt.9.9.2014. 2. The Group of Ministers, after elaborate discussions made certain recommendations for enhancement of remuneration to the functionaries working on contract basis in various Government Departments. Accordingly, with the consent of Council of Ministers orders were issued vide reference 2nd cited, enhancing the remuneration by 50% of the existing remuneration which was fixed based on the minimum of the relevant time scale of pay of Revised Pay Scales, 2010 or the existing remuneration, whichever is less, with a condition that the revised remuneration shall in no case be less than Rs.12,000/- p.m., w.e.f. 1st April, 2017. 3. In the reference 4th cited, the Council of Ministers has resolved for Extension of Minimum of time scale to the contract employees working in various Government Departments in the Revised Pay Scales, 2015. The benefit of Extension of minimum of time scale to the contract employees working in various Government Departments in the Revised Pay Scales, 2015 shall come into force w.e.f. 01-04-2019.
a. Remuneration thus extended shall from now onwards form an all inclusive consolidated monthly payment for all purposes. f. The departments shall draw utmost attention to the conditions as referred to above, while extending the remuneration (minimum of time scale in RPS 2015) to the personnel working on contract basis under their administrative control. g. These orders shall not apply to the Consultants/Advisors/ OSDs and also who appointed on specific consolidated pay working on contract basis in Government Departments. Extension of Minimum of time Scale to the Contract employees working in Government Departments in the Revised Pay Scales, 2015 AP GO Ms. No. 12 Finance Dt. 28-01-2019.